Three Brazilian officials were shot dead while investigating allegations that farm workers were used as slave labour, the Labour Ministry has said. A spokesman said the officials and their driver were ambushed in the state of Minais Gerais. But he said it was not clear whether the murders had anything to do with the investigations. Last March President Luis Inacio Lula da Silva announced measures to end slave labour in Brazil. A police spokesman said the driver had managed to alert the authorities before he died. The spokesman said police had been sent to the area, about 140 kilometres from the capital Brasilia, in a bid to catch the killers. Vice President Jose Alencar said in a statement: "This brutality will not go unpunished, all resources have been mobilised to catch the criminals." 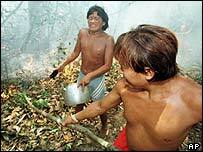 The Roman Catholic Church's committee on land reform has estimated that 15-25,000 Brazilians are kept in conditions equivalent to slave labour. Most are in isolated parts of the country, far from the capital, where powerful farmers hold sway. Labour Ministry inspectors travel around Brazil making surprise raids, often based on tip-offs, to find out if farmers keep their workers in slavery-like conditions. Any labourers found are set free.